Do you agree that company culture plays a fundamental role in your business performance, but cultural change takes too long, is a big pain and typically does not scale? In our NWoW (New Way of Working) journey in innogy we have improved our business performance and achieved over 400 Mio. € cash flow improvements over the course of the last several years by eliminating the „blocking symptoms“ in our culture. Furthermore, NWoW also moved innogy – compared to peers in an industry benchmark on “Organisational Health” (OHI by McKinsey) – from the lowest quartile in five areas into the top-ranking quartile in three areas and second quartile in the other two. As of today, this includes more then 30.000 employees in 8 countries (7 languages) and is performed by over 350 highly skilled NWoW (New Way of Working) experts enabling the whole organization to perform at a higher level. We aim to transform our way of working to focus on the most important resource of all: PEOPLE! By helping to unlock employee potential and by enabling everyone to feel heard and valued at work. Roland Hess Senior Vice President, Applied Excellence, innogy SE, one of the largest power and gas providers in Europe. 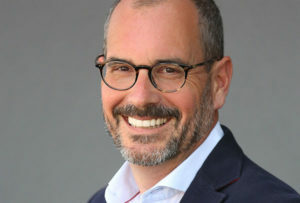 Roland joined RWE/innogy in 2010 and has been leading the company’s largest group wide transformation program “NWoW” (New way of working) since March 2014. NWoW focuses on improving everyday processes for 60,000 employees, by addressing organizational health, effectiveness and performance with a clear customer focus. In the last 4 years more then 10.000 employees successfully completed the NWoW journey and more then 25.000 employees are currently in 61 NWoW waves in the transformation. NWoW created 430Mio+ Euros on committed annual cash flow improvements. Furthermore, NWoW also moved innogy – compared to peers in an industry benchmark on “organisation health” (OHI by McKinsey) – from the lowest quartile in five areas into the top-ranking quartile in three areas and second quartile in the other two. More the 350 NWoW experts delivering NWoW as of today in 8 countries in 7 languages. Before joining innogy Roland Hess was a partner and member of the Global Technology Leadership Team for the Resources Industry at Accenture, founded as a partner The Advisory House Austria and also served as Chief Information Officer for ÖBf AG leading both the IT and change efforts. Currently, he is a board member and COO of Plause.com (on be- half of Innogy), creating a “fitness tracker” for organizational health, intended to help speed and scale up organizational transformation of large and small companies.